It is pleasant sometimes to get away from modern civilization and find ourselves in the ancient world of tribes who glorified themselves by discoveries in astronomy, knowledge in mathematics, architecture, writing, agriculture and the protection of their territories in the war with other nations. 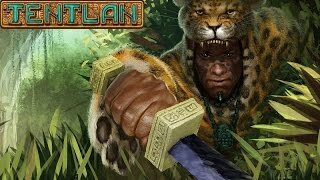 Tentlan game will devote you to the secrets of a bygone civilization and tell an alternative story of the fall of a great country. Once the rules of the empire "Eagle", glorifying and worshiping the great and mighty god Ahau Koot, who appeared to the lord of the ruling clan in the form of an eagle. In honor of Ahau, people cast a huge statue of a bird out of gold, decorated it with jade and turquoise, then placed it at the entrance of the main Temple of the Sun, located in the heart of the capital Nakumal. Nine tribes who swore allegiance to the emperor, worshiped the statue and guarded, believing it to be their relic. But the greatness of the "Eagle", with its achievements, wealth and splendor, caused outrage among the longtime adversary, with whom it had already fought a glorious people. The ruler of the clan "Valley" called for help northern nomadic people and decided to take revenge, unleashing a new war. The emperor died, the golden statue disappeared, the once great empire fell into separate settlements, the sky over Tentlan darkened when the god Ahau Kooth left the human world. In desperation, people are looking for a new leader who can play Tentlan, returning their former greatness, prosperity and beloved god. To unite people, you must show them your strength and ability to cope with complex tasks. Restore buildings, mine new resources, develop different industries, create armies and train new combat techniques. In each Tentlan building, its special features. They help arm the troops, train them, ask the gods for mercy, produce useful items, extract resources, accumulate capital, negotiate with allies, develop plans. You can build them only after completing certain tasks. Only then will the corresponding icon appear on the map, indicating new opportunities. To equip them with spears and batons, you need obsidian. And amber and turquoise are the main capital that can be earned by selling surplus goods or by robbing barbarian settlements. But even products can serve as currency, if we offer our neighbors a mutually beneficial exchange. Tentlan battles can be conducted in PvP and PvE modes, participating in battles between players or attacking computer-controlled characters. For each campaign, prepare yourself carefully, and then achieve the main goal - uniting the tribes into a new powerful Empire.